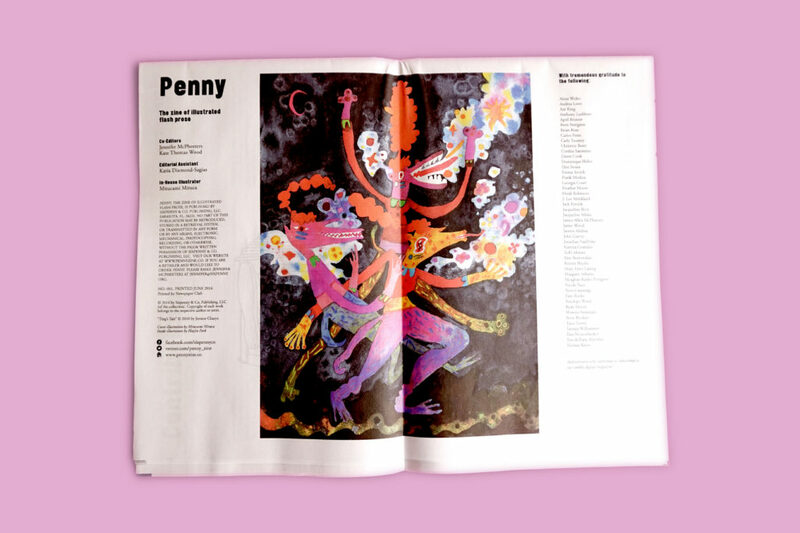 Our Newspaper of the Month for June is Penny, a new, collaborative publication of illustrated flash prose. 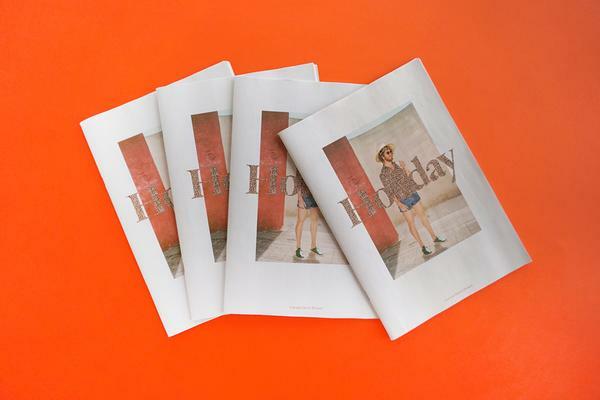 After a year-long digital experiment, Penny launched not one, but two print editions: a perfect-bound magazine and a digital tabloid newspaper. They polled their readers to pick the final format – and newsprint won! Issue One features work from 34 established and emerging illustrators and writers, including Jerome Charyn (whom Michael Chabon calls “one of the most important writers in American literature"). 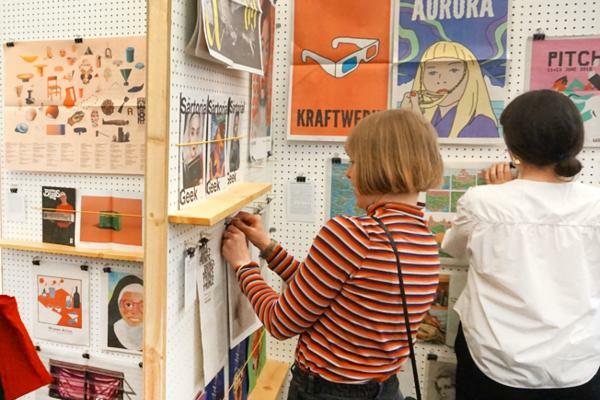 We caught up with co-editor Kate Thomas to find out why they made the leap from digital to newsprint and what the future holds for Penny. Penny Issue One. Illustration by Haejin Park. Penny celebrates flash prose. What is flash prose and what inspired you to start a publication about it? Flash prose is very short fiction, creative nonfiction or prose poetry. Flash prose is perfect for the new and unusual, because the reader gives less of their time and is more accepting of risks. It's also a great disruptor to the everyday because it can be read on a break, a commute, really whenever and wherever. Where does the name Penny come from? Penny is named after The Penny Magazine, an illustrated British magazine (on newsprint!) from the 19th century, aimed at the working and middle classes. 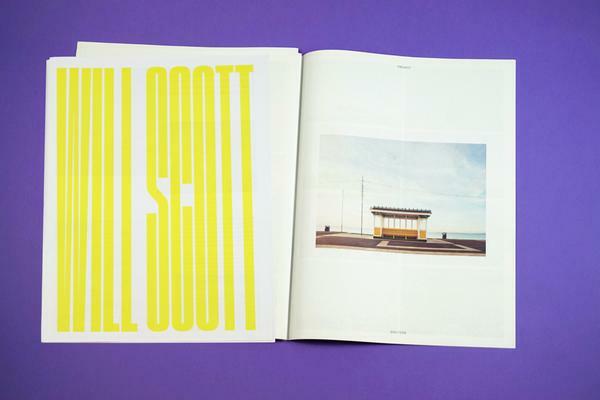 Why did Penny make the move from online zine to print? Did this change your approach to the content? Our main mission in publishing Penny is to bring more readers into the literary fold, and our move to print is a continuation of that goal. Print doesn’t have to compete with a thousand other things coming at you through your phone, and it also sits around as a reminder, inviting you to read it. Printing on newsprint also adds a new level of interactivity, as the illustrations get second lives as posters, and in this issue, there’s even an opportunity for readers to be their own colorist for one of the illustrations (okay, it's a coloring page). If you’re more digitally inclined, you can still find all of our content online. Our approach to curation will remain the same: wonderful illustrated prose that is more than the sum of its parts. Penny Issue One. Illustration by Carlos Brito. Penny was first printed as a magazine. Why did you decide to make a newspaper, too? We’re actually putting them out at the same time. My editing partner, Jennifer McPheeters, and I have joked from the beginning that we are a modern-day version of The Odd Couple. She goes for all things classic, and I like to experiment, stay fluid, and pull in different ideas. I’ve been obsessed with newsprint for years, and when we discussed the move to print, I seized on the chance to see our wonderful illustrations printed large enough to feel like it's your whole world in that minute, and as a format it makes us affordable to more people. Jennifer envisioned a more traditional format that would look right at home on your bookshelf. Realizing that we represented two different sections of our demographic, we developed both iterations. 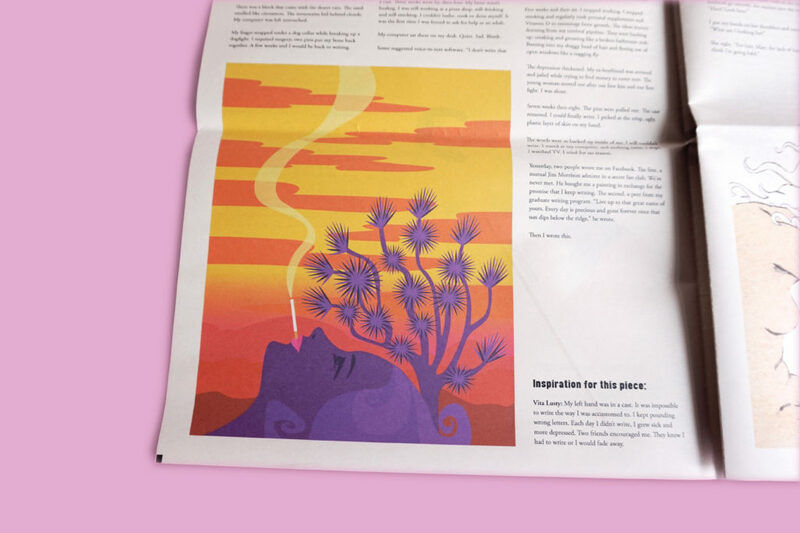 We’ll let our readers decide for themselves what a literary zine of illustrated prose should look like! Penny Issue One. Illustration by Rachel Lesser. How do the illustrations and writing work together? Does one inform the other? Our illustrated shorts are a call-and-response between talented artists. Sometimes the call comes from the illustrator, and sometimes it comes from the writer. But in every instance, the best combinations complement, rather than explain, each other. What’s your favorite part of putting together a print version of Penny? Hands down, seeing it in print. I’ve been designing digitally longer than I have in print, and though a print publication is not nearly as forgiving of mistakes as a website (you can’t undo a printed typo! ), printed material gives a much more visceral satisfaction, and it feels a lot like finding treasure. I’ve been collecting old newspapers and magazines for years, so to make one is a real joy. Penny Issue One. Cover illustration by Mitucami Mituca. If you live in the UK, you can get your hands on a copy of Penny in The Newsagent. Otherwise you can find it right here for $10 (or online for free). Keep up with Penny on Twitter and look out for Issue Two, which is open for submissions now.